I decided on butterflies – I didn’t want to do something to complicated as I’ve not done this for 2 years and I’ve already tripped over boat loads of frustration while attempting to figure stuff out .. I’m telling you – yoga has never been so helpful haha – altho today Im not so sure it will help. 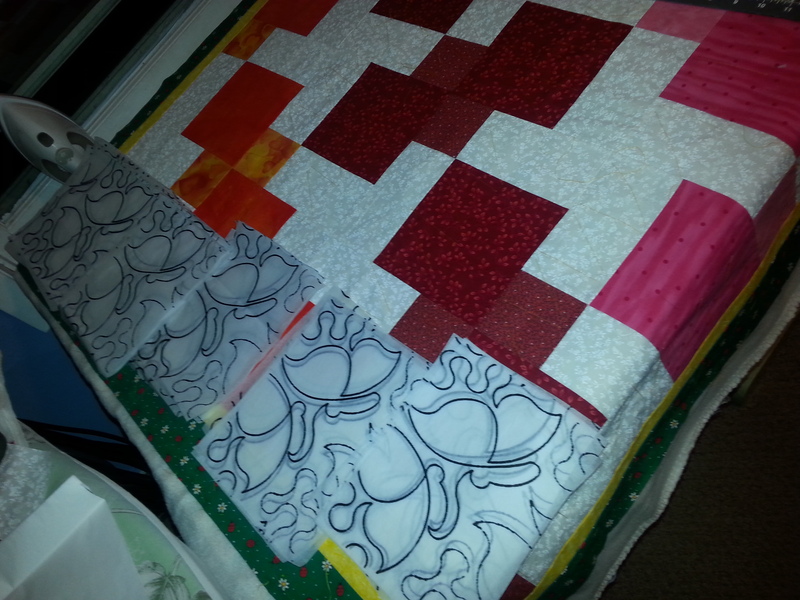 Now just to decide if edge to edge or just the inner quilt top and then something on the borders. The way I feel right now – edge to edge hahaha I know I have a week to get this done – but would rather have it ALL done as I’ve plans for Saturday so this really needs to be done by Friday. And I am facing challenges while doing this quilt. I can remember I would be able to look at something and know how many / where to cut .. now it’s serious rocket science. I’ll be pulling out my Singer 15K for this like I always do, I LOVE LOVE LOVE that machine for quilting. Hmmm come to think of it, I’m not sure I’ve seen my quilting foot for my machines – Good thing I do free motion quilting.